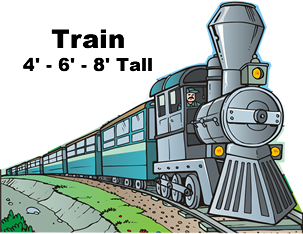 Train 1 Cardboard Cutout Standup Prop - Dino Rentos Studios, INC. This Train 1 Cardboard Cutout Standup Prop is great for any transportation themed display or production! This train is right on track! It is exactly as pictured and arrived promptly. I am so excited about using it at our theme party!!! Everyone will be saying, "All Aboard!"